Want to lose weight? Try with steamed foods (oil free) like vegetables, nuts, fish, chicken and more. Steamed foods are easy to cook and tasty to eat. Without oil and butter steamed foods are good to eat. 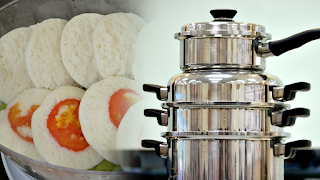 Here are some points how steamed foods are help in weight loss. 1. Steamed foods fight with your hungry. Yes. You can try with steamed vegetables. 2. It only loses 10 to 20% of vitamins and minerals - not 80% like other cooking. 3. You can do steam cooking -- most of your normal food without oil. 4. It contains few amount of calories and cholesterol. 5. It increase digestion, removes unwanted gastric problems.